A few days ago I saw on Rhondas blog a pattern that I just found encapsulated exactly the look I wanted for a dress I need to make for one of two black tie events I have coming up. 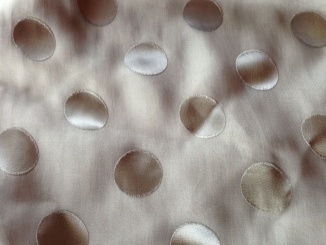 I had bought some gorgeous grey chiffon and have been searching for the perfect pattern . I know that is not the way I should approach my sewing. The pattern should come first, but the fabric is the inspiration a lot of the time for me . I fall in love with the color, texture drape or some other element and I have to have it. Then I need to find the perfect design and hope that I have enough fabric to make it. This I think adds a little more to the excitement and the challenge if you are a little short to be a more creative . The process of developing a loved piece of fabric into a garment that will fill a void in the wardrobe or just add to what is there is so enjoyable, and incredibly satisfying. I am at present attempting to imagine the pattern for this design and draft it myself we shall see if it works. This silver chiffon is not my only evening option but it is the one I am most excited by. I have a few other creations to share with you but my photographer cannot take pictures until later today so I will post again soon. Gorgeous fabric, it will look lovely with that pattern. It’s the way I approach things, fabric first, pattern later. Thanks Barbara , I had been looking at this fabric for a while and I really couldn’t justify the cost when I do have lots of other choices in my stash but then it was on special so I had to indulge. Hopefully I can interpret the pattern correctly.